To get from Split to Brac island, Makarska, Korcula, Mljet and Dubrovnik, you couldn't do better than the fast and comfortable Krilo Eclipse. This new passenger ferry was brought into service for the summer of 2017. 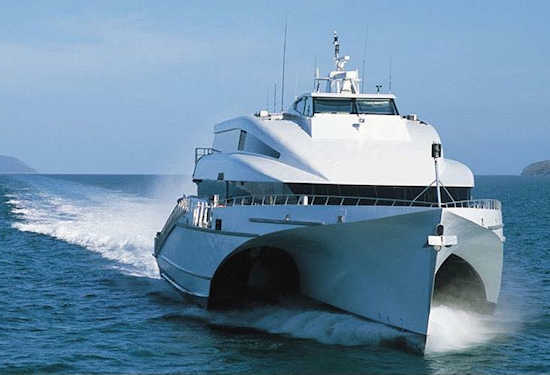 It's fast (40 knots max) and can carry up to 473 people. It is the only ferry service timed to allow a day trip to Bol from Split and the only passenger ferry service from Makarska to the islands. There's also a similarly timed ferry that goes to Pomena on Mljet and Milna on Bol. See the Split-Brac-Hvar-Korcula-Mljet-Dubrovnik schedule. This ferry is run by Krilo. Online booking is available through the website.